Southern British Columbia to Northern California. Moist to dry climate found from the coast to middle elevations. Fairly common understory in mixed conifer forests. Less abundant in Washington, very common south of the Siuslaw River. National Wetland Indicator species, however no anaerobic tolerance. No information on succession other than “This species sprouts well after fire or cutting and brings an encouraging touch of colour to cleared areas.” (Pojar/Makinnon) This suggests a colonizer habit. Collect seed late summer to early fall. The seeds require light for germination. 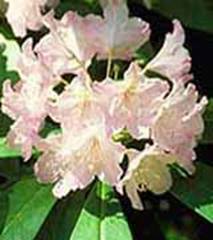 Pacific rhododendron seeds germinate without stratification and are viable for up to 2 years. A cool, dry, dark place is recommended. Moist well drained soil, low nitrogen availability. Sandy loam would be best. Inoculation is not necessary, however many studies have shown a mycohirrizal interaction. Container plants grown from seed or cutting. Aeration is a key requirement due to its shallow root system, as is a moist acidic soil. Perennial. The flowers are pollinated by bees and plants begin to bear seed when they are 5 years old. Pacific rhododendron seeds germinate without stratification and are viable for up to 2 years. The seeds require light for germination. The will typically reach 3 m at 10 yrs. They reach up to 5m at maturity. If aboveground portions are killed, Pacific rhododendron can regenerate vegetatively by sprouting from stem bases and from the rootcrown.